Today I'd like to share an Essie polish - Armed & Ready. This is a gorgeous dark grey taupe with tons of gold micro shimmer. 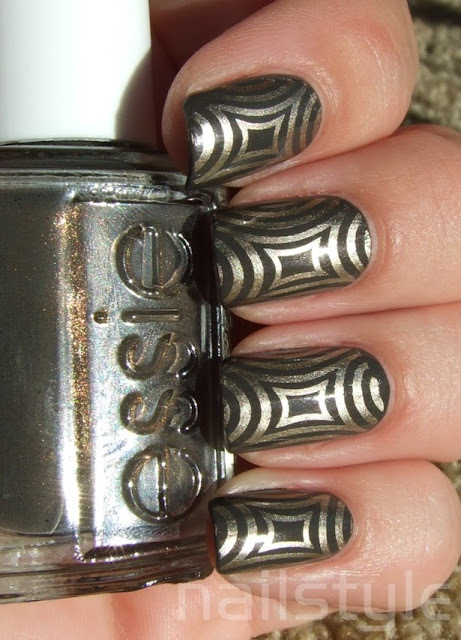 The formula was easy to apply and typical of Essie - dried nice and quickly. I thought I'd break out of my comfort zone and try a stamp I hadn't used before. This is Konad plate S6. It was actually a bit of a challenge lining up the image so that it stamped centrally on my nail. A couple of images aren't quite right but I can live with it! Interestingly my right hand turned out slightly better but it's a challenge to photograph it so you're stuck with my left! This is Armed & Ready on it's own. You can see the gorgeous shimmer in the bottle. Unfortunately it was quite late in the day so the colours are not the best - although still pretty accurate. Looks fab! I have the Essie and that stamp but yet to wear either one properly. I only used the Essie in part of a manicure so wasn't obviously in use! Here's my trick for perfect alignment. Place the stamper at the base of your nail and get it centered where you want the design to be and roll it up keeping the base still touching. Does that make sense? It is somehing I figured out and it really works for me. Love this design. Psychedelic! I can't even describe how much I love this mani! Love the colour combo; and the image! Why . . . thank you very much! This stamp pattern is fun!